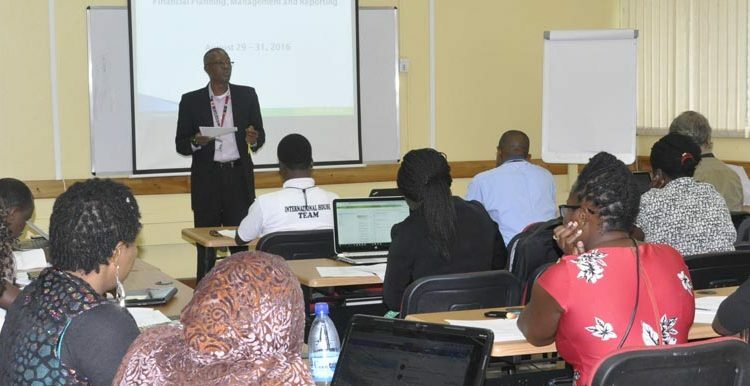 Selected budget handlers and finance controllers across IITA hubs in Africa converged in Ibadan for a 3-day workshop from 29 to 31 August, to enhance their knowledge on acceptable modes of using and managing the financial resources of the Institute. The training tagged “Financial Planning, Management and Reporting” was organized by IITA’s Capacity Development Office (CDO) in partnership with the Finance Office, and brought together IITA staff from Kenya, Nigeria (Ibadan, Onne, and Kano), Sierra Leone, Tanzania, and Uganda. The workshop was necessary to improve the effectiveness of staff in financial and project management, and keep them abreast of IITA procedures and practices in financial management and reporting. Sholola explaining to participants the training objectives, stressing the importance of IITA’s zero tolerance policy for fraud. Welcoming the participants, Kenton Dashiell, Deputy Director General, Partnerships for Delivery, urged the participants see the training as an opportunity to learn and improve their financial competencies in project delivery. “People should be able to do something differently after this training,” Dashiell stated. Director of Finance, Omoshalewa Sholola, explained the training objectives and their importance, stressing the issue of fraud prevention. He encouraged the participants to be honest and to desist from fraudulent practices, reminding them of the zero tolerance policy for fraud at IITA. “Avoid fraudulent practices at all levels…the issue of fraud should not occur anywhere in IITA. Management has zero tolerance for fraud, and where we are able to achieve some reduction in waste and fraud will go a long way to promote IITA’s good reputation and image to the outside world,” he said. Zoumana Bamba, Head CDO, also encouraged the participants to make maximum use of their training time, and use the acquired knowledge in their individual offices. “When it comes to project management, finance is one of the main areas of focus. Investing in improving the skills of our staff is critical to ensure we deliver effectively in our projects and mandate,” Bamba said. The training covered all the financial policies, procedures, and practices of IITA. The course was very interactive and participants expressed their gratitude to the organizers of the training. The participants also agreed that there was an immense need to regularly train project managers and budget officers across all Hubs, to ensure that best financial management practices are imbibed. Certificates were issued to the participants at the end of the course.